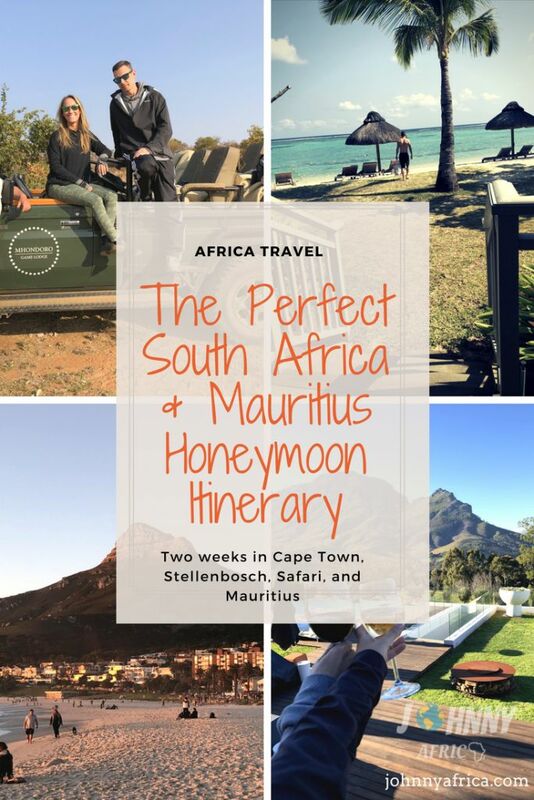 Recently, I planned my friends’ and newlyweds honeymoon to South Africa and Mauritius. 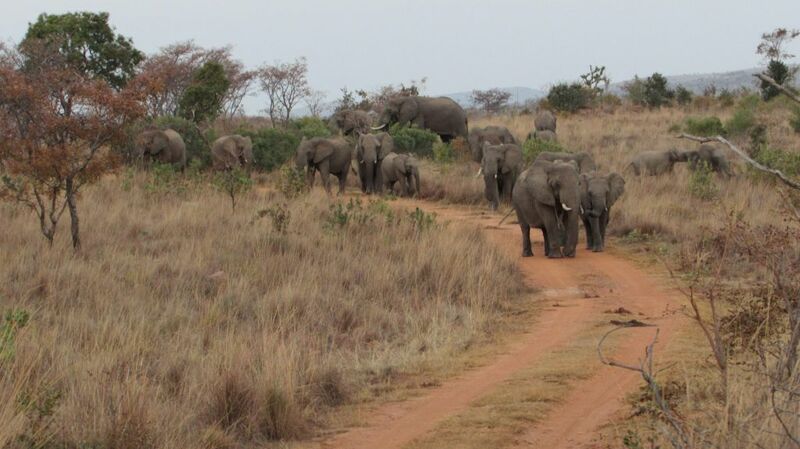 The following is written by fellow traveler and newly minted Africa enthusiasts Brandon and Lauren Stein. Long before becoming newlyweds, my wife and I decided against the traditional honeymoon of an all-inclusive beach-laden resort with non-stop guzzling of tropical drinks and tequila shots. We did not want to be stationary, seeking adventure and a destination we likely may never get the opportunity to visit again. 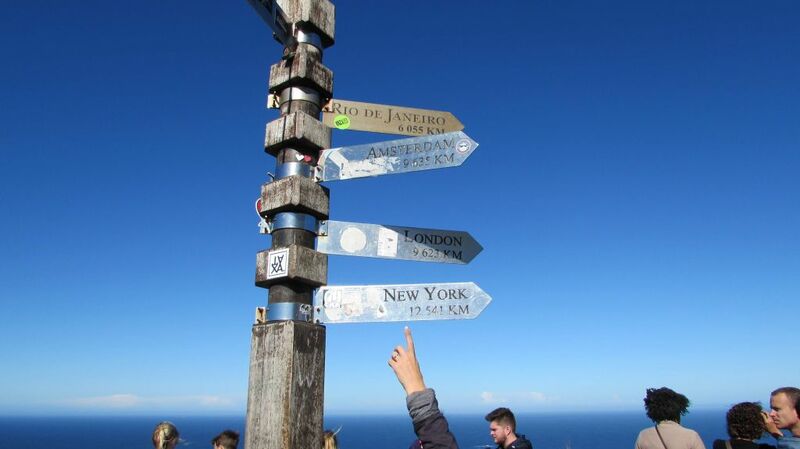 We had two choices in mind; South Africa/Mauritius or Australia/New Zealand. Lions and elephants or kangaroos and koala? Safaris and Lion’s Head or the Great Barrier Reef? After weighing our options and discussing with Johnny, we had our minds made up. 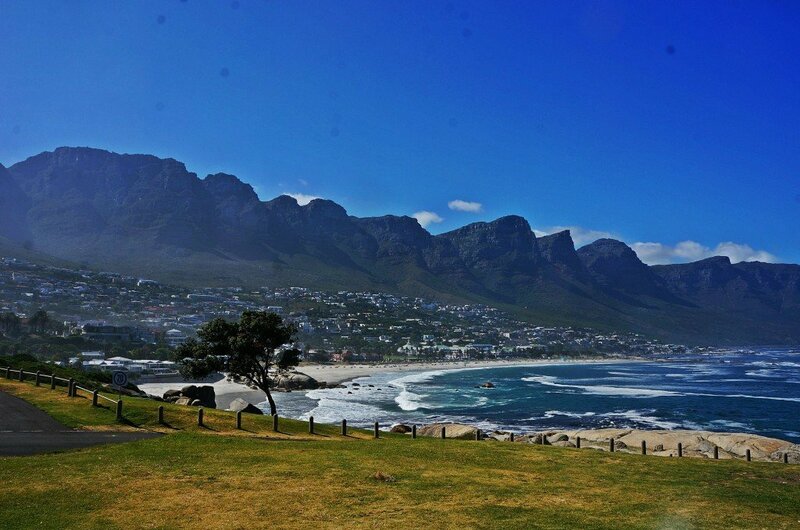 Next stop, Cape Town, South Africa. Beautiful sunset in Cape Town’s Camps Bay, where we stayed. 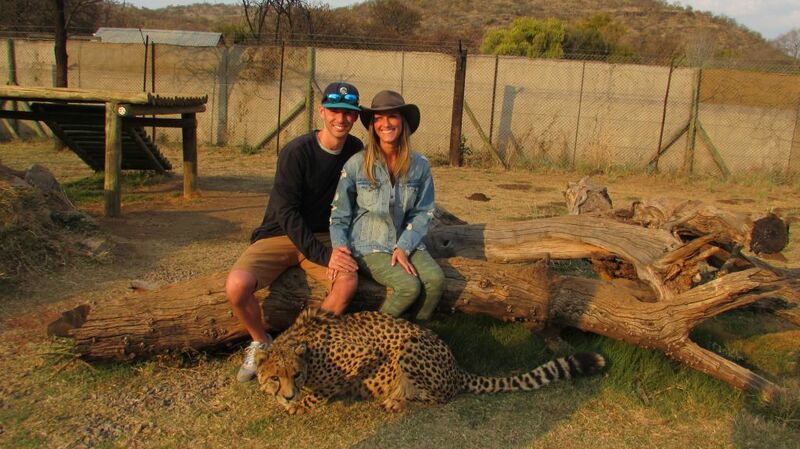 South Africa is the perfect honeymoon destination. 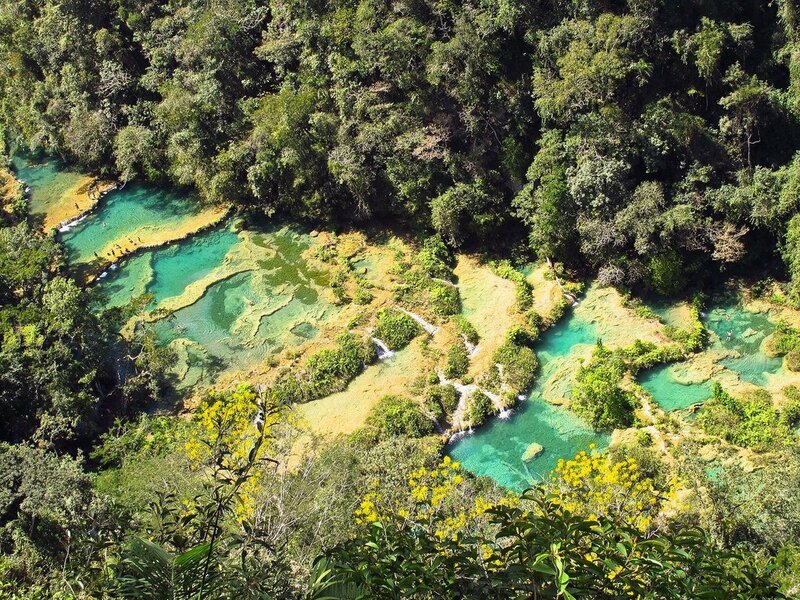 From the immensely adventurous to the overly romantic, there is something here for everyone. While South Africa has countless beaches, those looking for a tropical island getaway can combine it with the neighboring countries of Mauritius, Mozambique, and Zanzibar. After weighing the options, it became clear that we couldn’t go wrong with any of those amazing options. We ultimately settled on Mauritius. We began our search for the perfect honeymoon itinerary by contacting numerous travel agents near us. 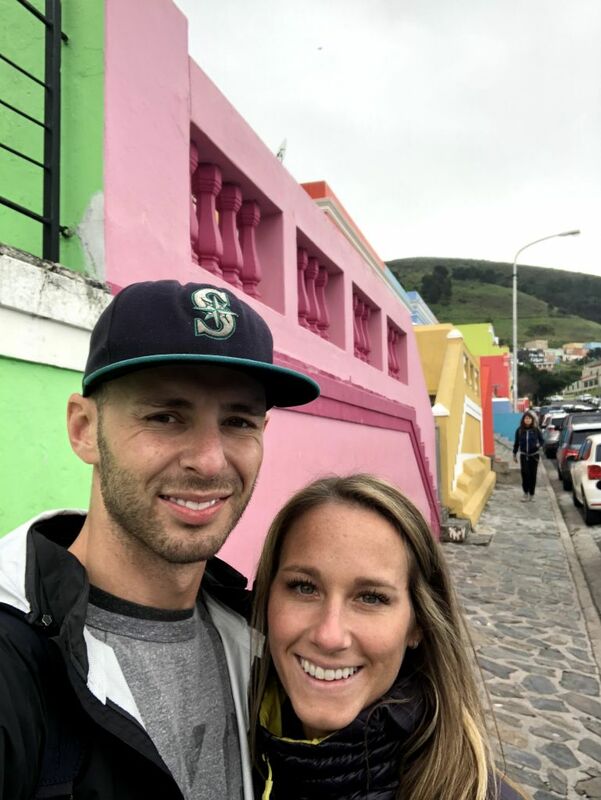 We told them our timeline was just shy of two weeks and we wanted to see Cape Town, an amazing safari experience, and a relaxing/luxurious beach destination. We received itineraries and estimates from numerous companies which all looked amazing. 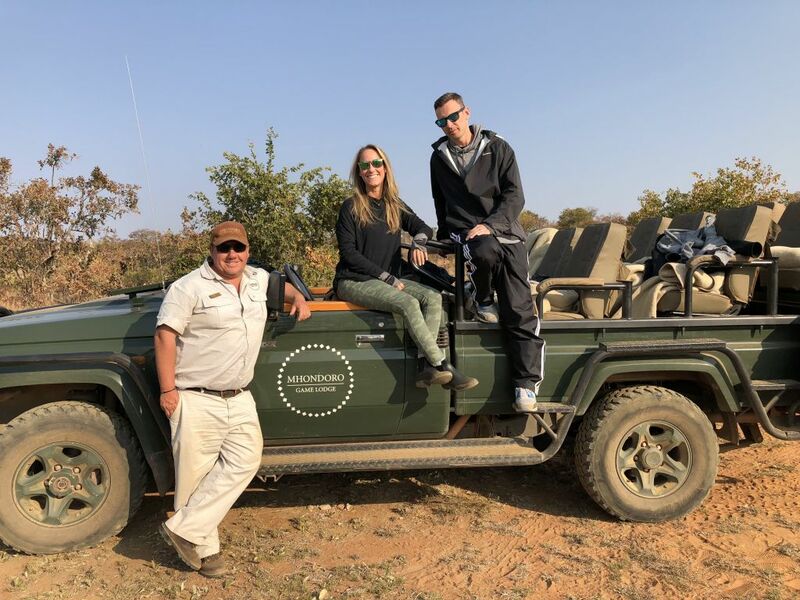 We were about to settle on an itinerary that featured Cape Town for 4 days, a safari for 3 days at the Singita Lodge in the Kruger National Park, and 5 more days in Mozambique. The total cost of this trip would have been over $16,000 (which included international and domestic flights from NYC). We assumed this was a good deal and as it was our honeymoon, were ready to pay the costs. On a whim, we decided to ask our friend Johnny what he thought of this package. Johnny said it was a good itinerary but the cost was far too much. Sure the travel agencies had to make their money somehow but South Africa is not cheap but not that expensive of a place and it could be done for cheaper. Few conversations later, Johnny offered to help us book our entire South Africa honeymoon for us and became our de-facto travel agent. Since he lived and traveled extensively through the region, we trusted he would know what to do for us. The best part? He was absolutely right about the costs. Not only did we stay in nicer, more unique accommodations, but the total cost of the honeymoon was under $11,000. A savings of more than $5,000! We could have done it for even cheaper but we waited a bit too long and the flights had gone up in price. We’ve since recommended him to many of our friends who were in similar straits. I think for many people, they assume they need to go through some sort of travel agent because this is their big honeymoon trip. But the reality is that the travel agents just follow the same itineraries they give everyone else but up-charge as it is their full time job. Johnny has lived and traveled extensively through the continent so he knew exactly what to recommend for the things we wanted to do! If you’re interested in similar services, make sure to contact Johnny! 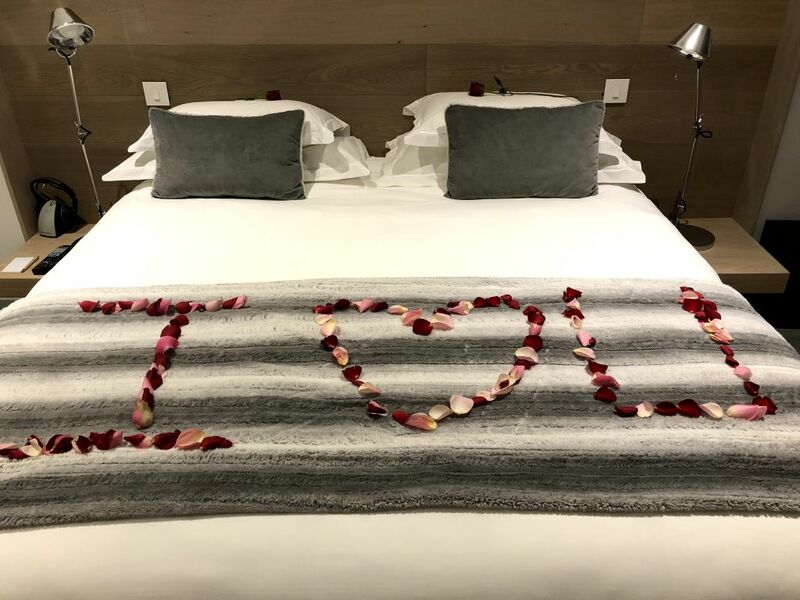 He will more than happy to assist you with booking your honeymoon to the Rainbow Nation or really most other places in Africa as he has traveled all over the continent! In addition, Johnny has planned many more honeymoons since ours. 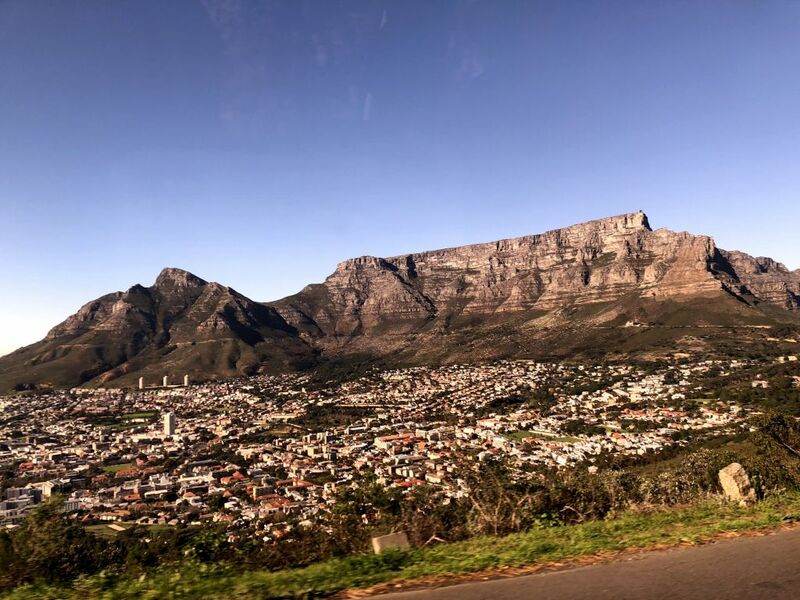 Be sure to read the other trip reports to get an idea of what South Africa and the surrounding countries have to offer! 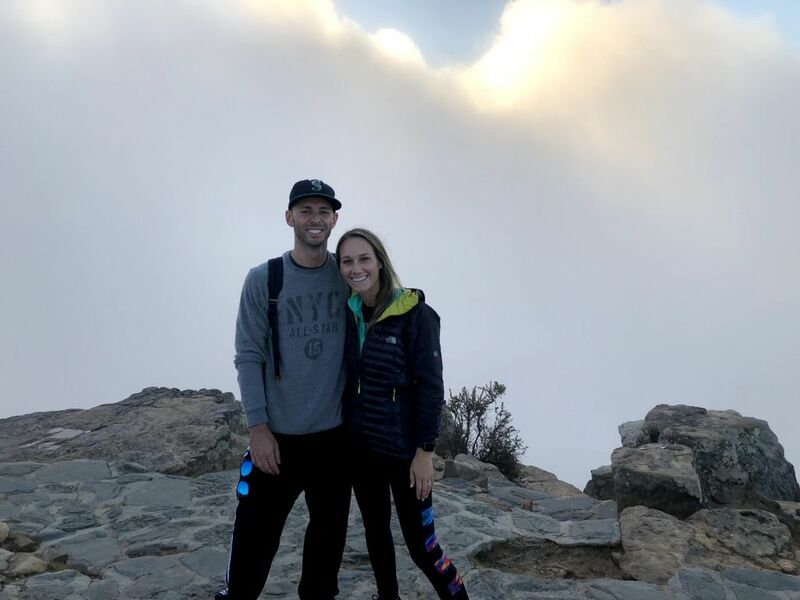 As most northern hemisphere couples choose the summer months to get married, our trip took place in August, the “winter season” for the Rand-spending folk. It was crisp in the morning, but warmed up to 75-80 degrees Fahrenheit by mid-day. Optimal temperatures to spend navigating outside. Winter in South Africa spans from April-October. Note that some restaurants and things close during the winter months as this is the slow season for tourism. While the weather in Cape Town is highly variable during these months (we got lucky and had sun every day! ), the weather around Johannesburg is a nonstop sunny and pleasant climate. It is dry, but it is very comfortable and if you need to convert the Fahrenheit to Celsius, subtract 32 and divide by 1.8. Okay, enough with math and more about South Africa. As for packing, a light jacket and some long sleeve shirts are all that’s needed for the coldness. My wife brought a North Face zip up hoody which she wore most of the time. While the South Africans find it cold, and we saw people wearing coats, it does not get cold enough to warrant bringing a puffy jacket. Pack light and enjoy! Make sure to have a high quality camera with a high zoom to get close up shots like this one. 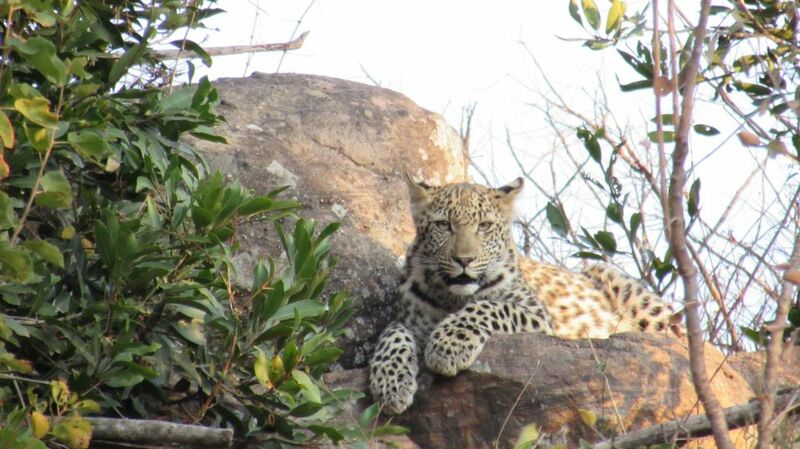 As for safaris, make sure to pack a proper DSLR with a high zoom lens for the best pictures. Invest in the proper equipment for something as special as this. If all else fails, befriend the people with the fanciest looking cameras on your safari and politely ask for photos to be sent. We debated renting a car in South Africa. Johnny recommended we do this as it would give us more freedom to explore on our own, not to mention save a lot of money in the process. In the end, because we only stayed in the Cape for 6 days, we decided against it, especially as we’d have to adjust to driving on the opposite side of the road! 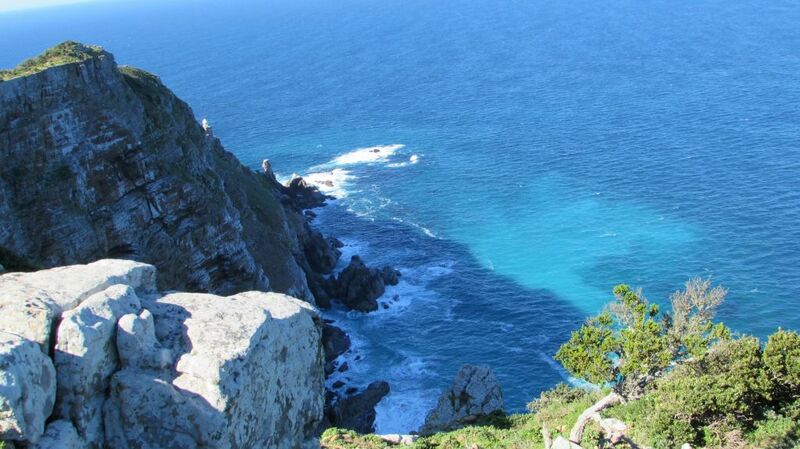 Nevertheless, if you are staying for longer, and plan to road trip the Garden Route, this is highly recommended. For the final itinerary, Johnny planned it and organized it all in an amazing Google Sheets that we could access and collaborate before and during. To see our final itinerary, please visit his great travel itinerary spreadsheet. 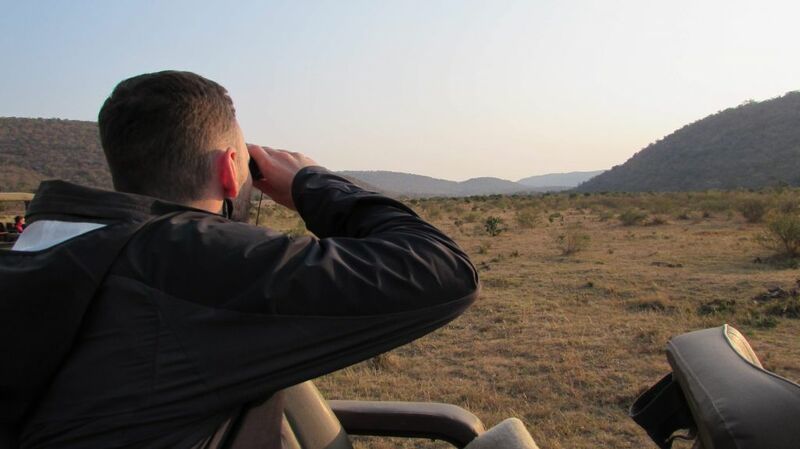 In addition, throughout this post, there will be links to other posts about Africa that Johnny has written but go into detail on the places we visited! We had heard countless tales and media recounts of how dangerous South Africa is. Having never been there, like most people, we succumbed to some of these fears. Johnny assured us that while South Africa has its problems like any other developing nation, crime is not rampant and it is not the lawless place it’s made out to be. During our time in South Africa, we never felt unsafe at any point. I highly recommend reading his blog post on Is South Africa Safe for a better understanding of the country. With that said, I would recommend anyone visiting to be aware of their surroundings and to not flaunt the cash. Essentially, take precautions like you would in any big city and avoid the areas that are known to have crime. We felt totally safe during our South Africa honeymoon and would highly recommend it! At last, time to talk about our trip! Our trip left from New York’s JFK where Johnny recommended we fly Emirates instead of South African Airways. Of course the flight is long, but my new brother & sister in law surprised us with an upgrade to business class for 12 hours aboard Emirates which made the trip much more tolerable. That’s just to Dubai. Beautiful Cape Town with Table Mountain in the background. Tack on another 9 hours heading southwest and you find yourself in Cape Town. Upon landing, Johnny had our car service already waiting for us, helping us shlep our luggage to his car before a drive to our hotel in Camps Bay, the first stop on our two-week journey. 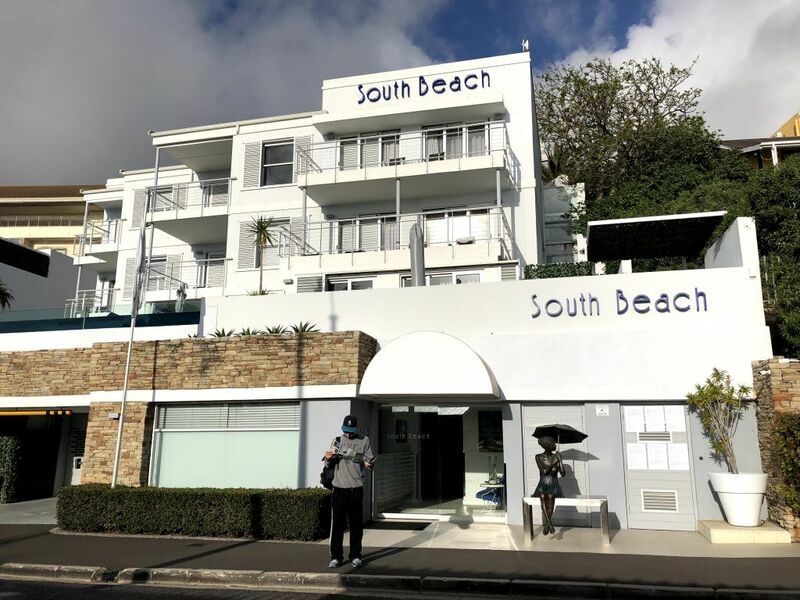 We stayed at the South Beach Hotel in Camps Bay. It is located right across from the ocean, an arrangement of villas surrounded by PLENTY of restaurants. 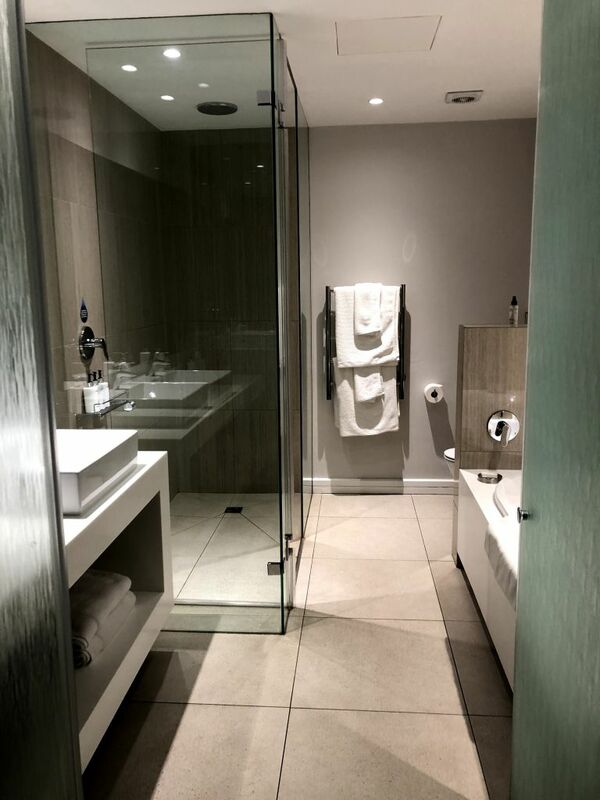 This boutique hotel has a Miami vibe, rooms are very sleek and modern. Not to mention the overhead rainfall-style shower, a kitchen stocked with some drinks and snacks and the daily morning delivery of croissants. The views of the ocean every morning were amazing. 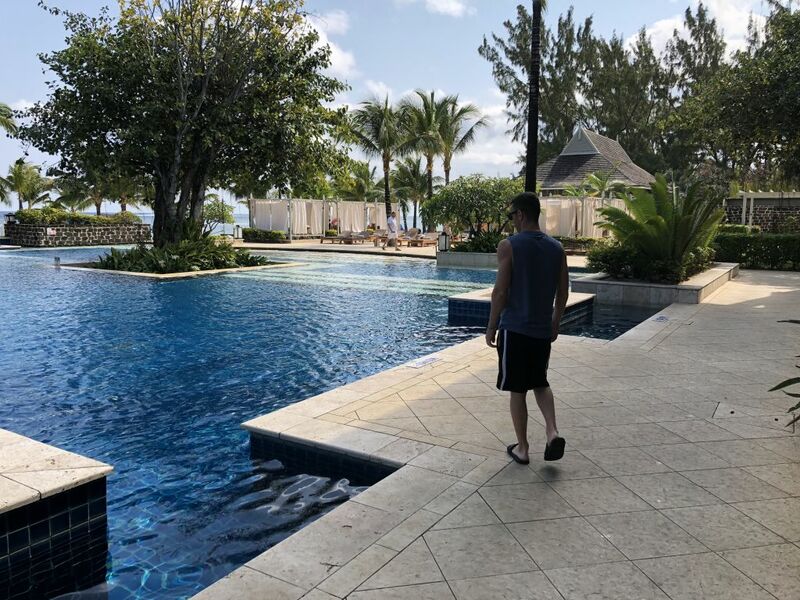 The pictures of the hotel online are taken during the summer months and I could see it being much nicer during the warmer months as the pool was offline during our stay. A lovely surprise when we arrived! 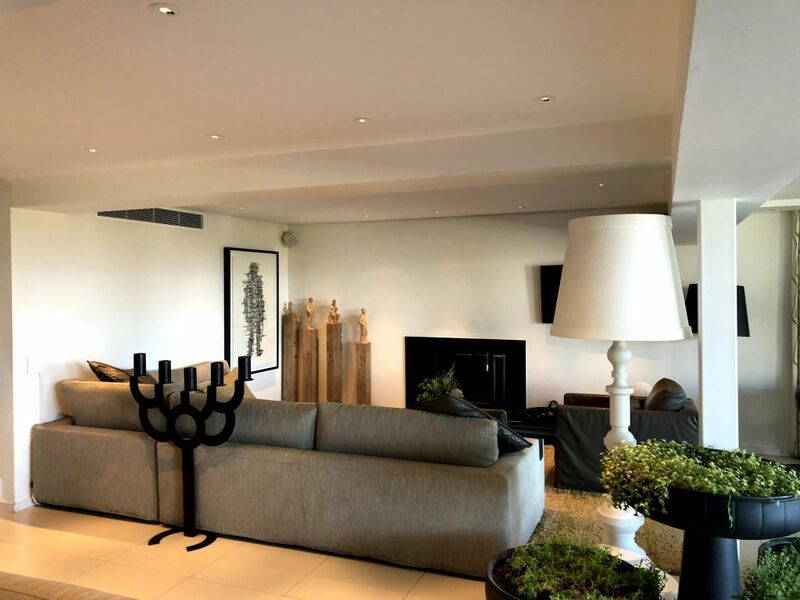 Johnny recommended we stay in Camps Bay instead of the V&A Waterfront which was what our original itinerary had us staying. He was right. 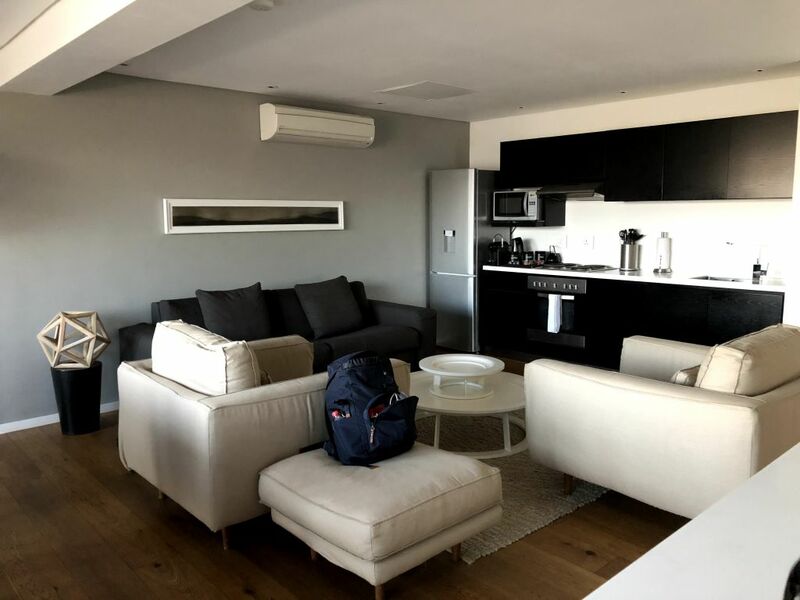 With proximity to the beach and stunning views of Lion’s Head and the 12 Apostles from our balcony, this hotel is a dream stay in Cape Town. 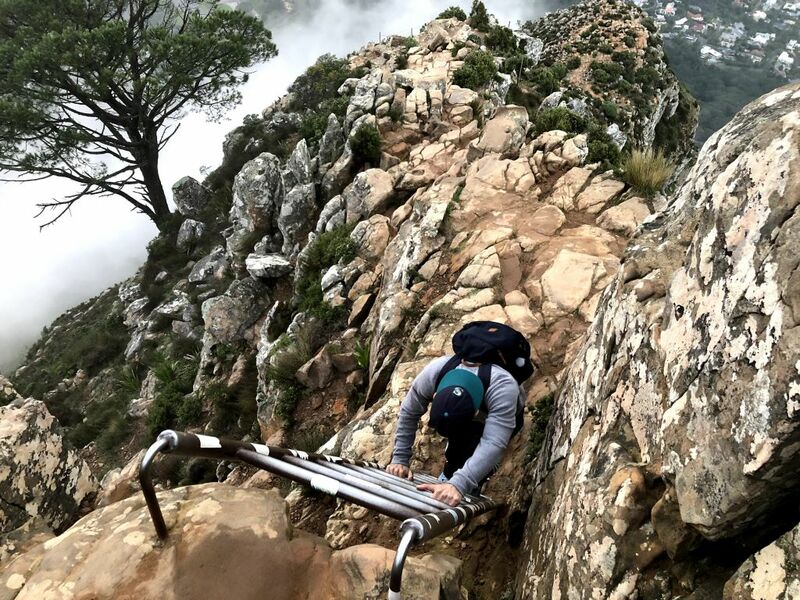 We had heard all about Table Mountain and had this slated at the top of our list. Unfortunately, the table cars were under construction during this time so our only option was to hike Table Mountain. Johnny raved about Lion’s Head and recommended if we had to pick between Table Mountain and Lion’s Head, the latter is the winner. 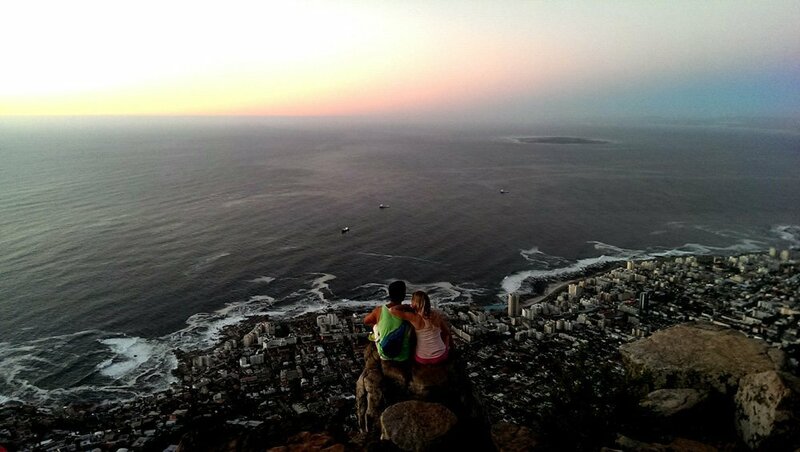 Lion’s Head mountain is a top priority in Cape Town and perhaps our favorite place in the city. 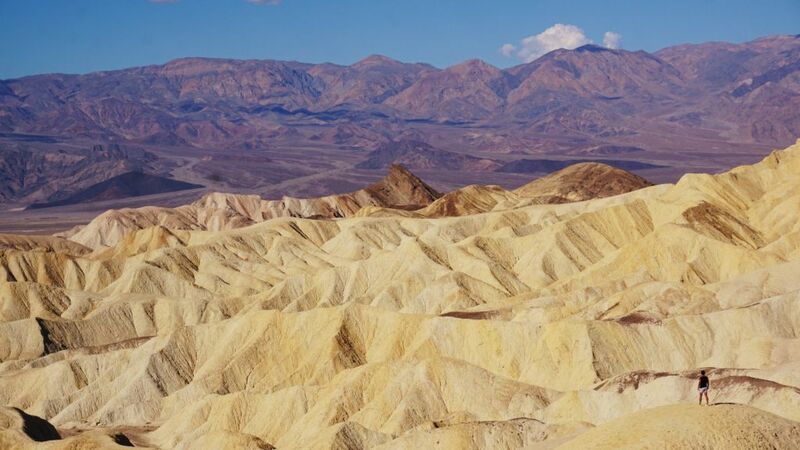 The hike is approximately one hour up and another to come back down, but offers unrivaled views, especially during sunset. It is magnificent and a must-do if you are in the vicinity. At Johnny’s recommendation, we brought a bottle of wine with us to drink at the peak while watching the sunset. Highly recommended. Make sure to have some lighting available (camera flash is doable) for the climb down in the dark! Unfortunately, the clouds wouldn’t budge when we were at the top but the climb was still well worth it! We had also planned to do a paragliding tour from Signal Hill adjacent to Lion’s Head. Unfortunately, the wind was weak on our scheduled date and it was canceled. Next time! The view from Lion’s Head on a clear day. Other things to see in Cape Town include a free walking tour, the V&A Waterfront, Camps Bay beach, Clifton beach, and Bo-Kaap neighborhood. Cape Town also has a fantastic culinary scene with steak being readily available and incredibly affordable. We wanted to try the Test Kitchen and the Pot Luck Club but they close for a few weeks in the winter months. Bo Kaap Neighborhood of Cape Town during our walking tour. 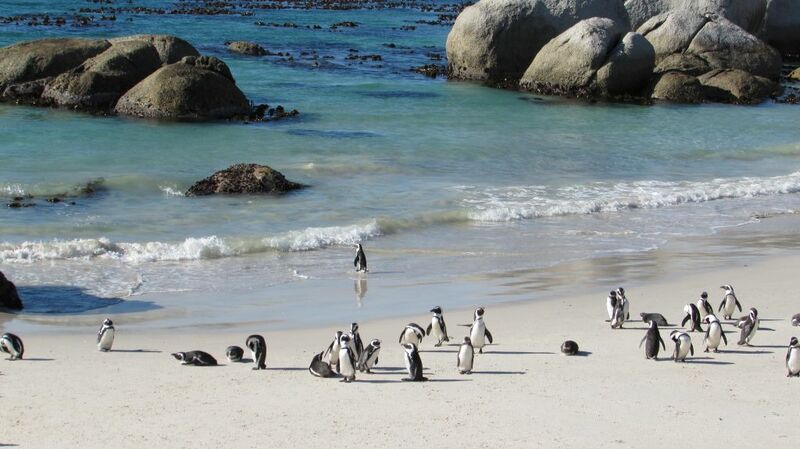 Other visits while in Cape Town included a day tour to Boulder’s Beach to see the penguins. 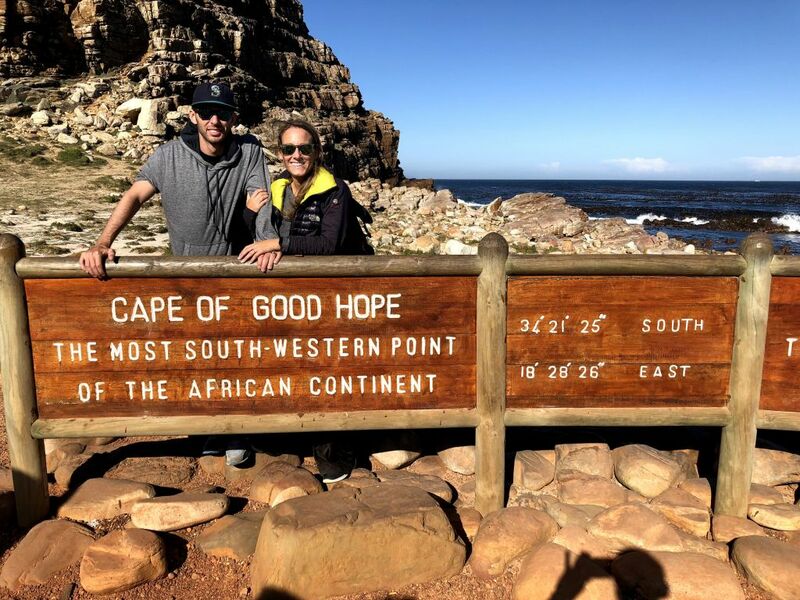 After visiting the penguins, the rest of day was spent at Cape Point and Cape of Good Hope, the southwestern tip of the Cape peninsula of the African continent. 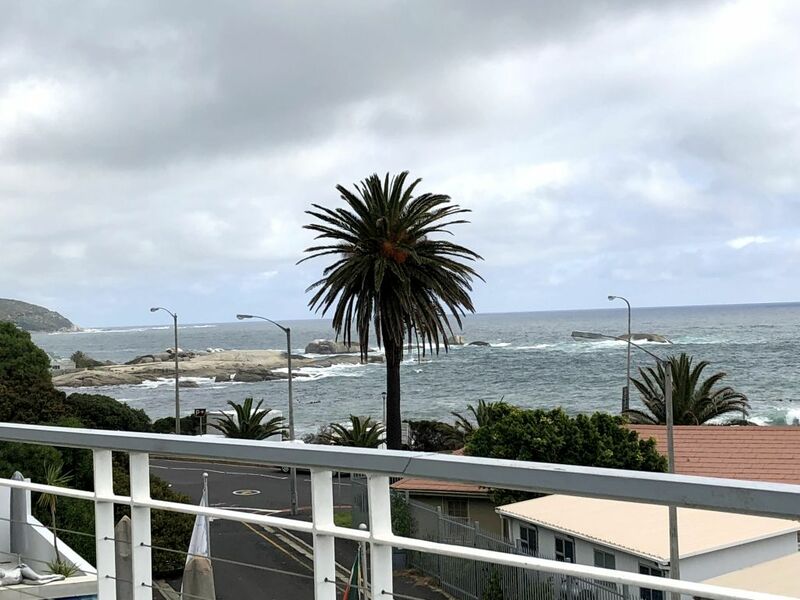 Fantastic views of the Atlantic and Indian Oceans and some other wild exotic animals can be seen during your time here but is mainly a hiking and sightseeing destination with expansive views. We’re a long way’s from home. Johnny always raved about Cape Town and how it was his favorite city in the world. I can definitely see why. 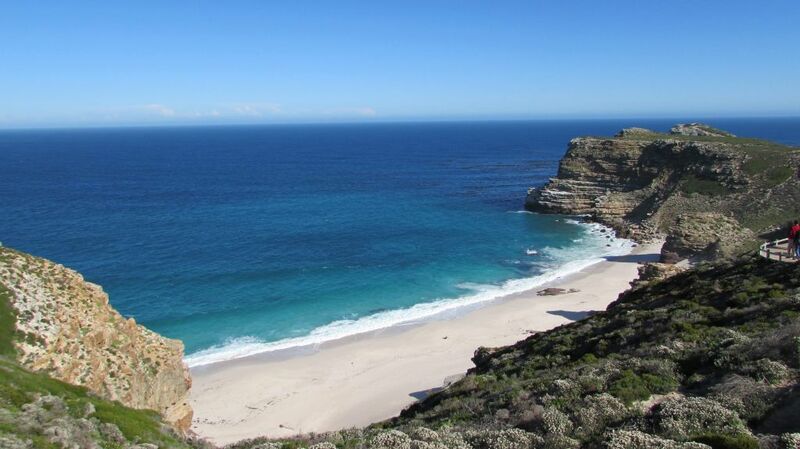 There is just to much to do and see in Cape Town that three days will barely scratch the surface. I really wanted to go shark cage diving with the Great Whites but we didn’t have time for that unfortunately. Nevertheless, we very much enjoyed our time here and would have stayed more days if time had allowed. 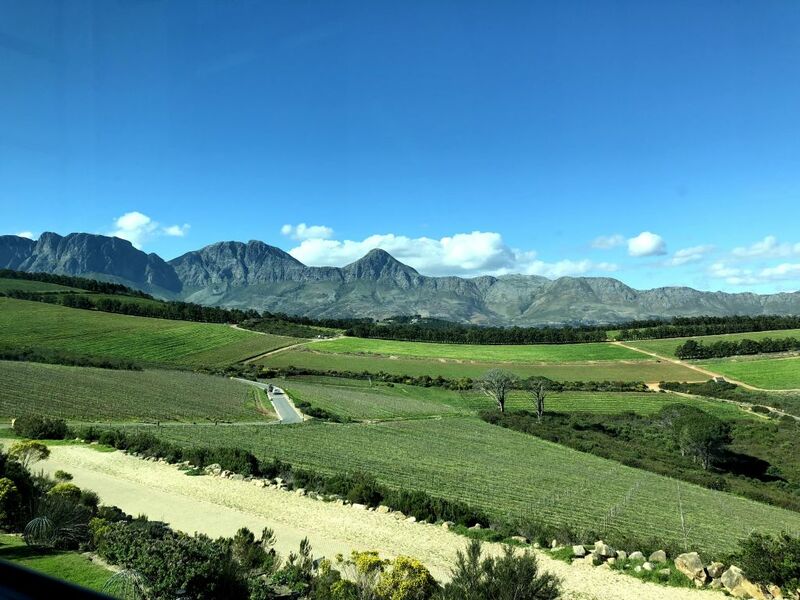 Departing from Cape Town, our next stop was Clouds Estate in Stellenbosch and along the way, we would visit two wine farms. 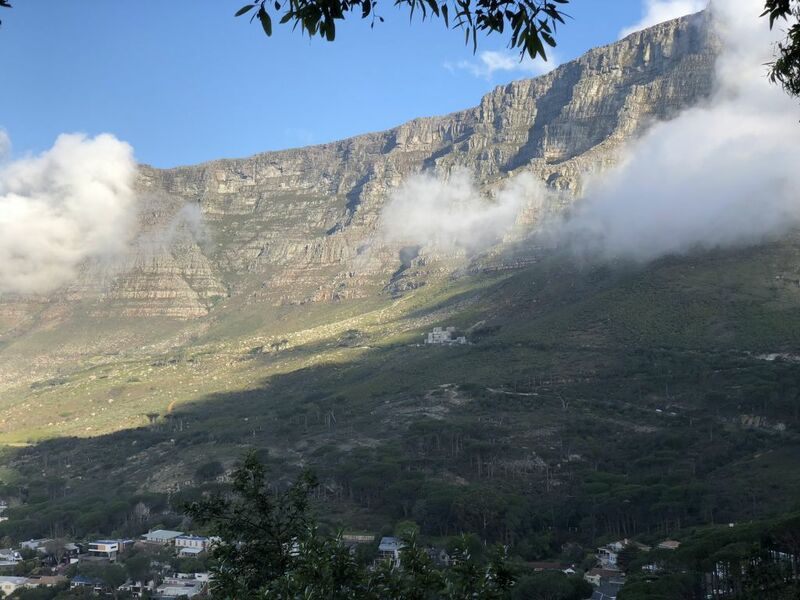 This was a total scene shift from Cape Town, and offered some of the most incredible mountainous views of the region. 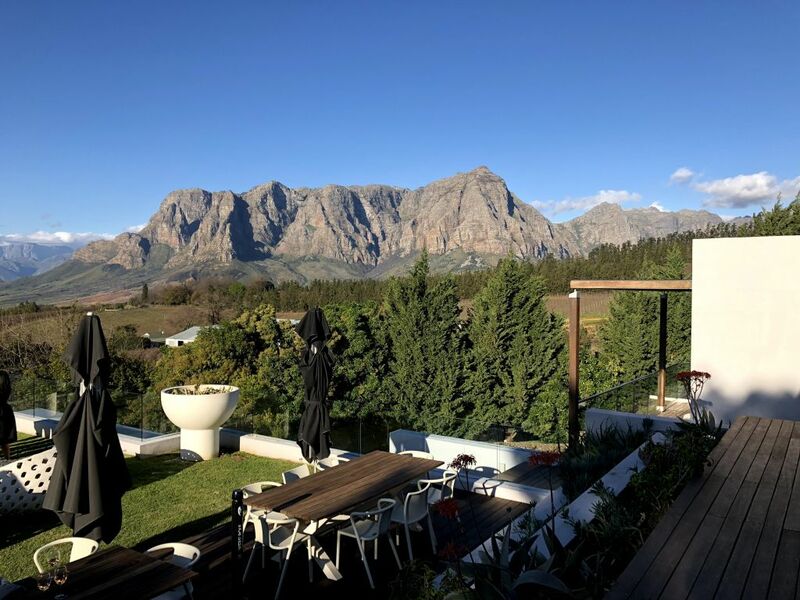 Stellenbosch is a town half hour east of Cape Town. It is dominated by wineries and viticulture and Clouds Estate was situated right in the heart of it. The whole region is incredibly beautiful and Johnny highly recommended we spend more than a day trip here even though we are not wine experts. 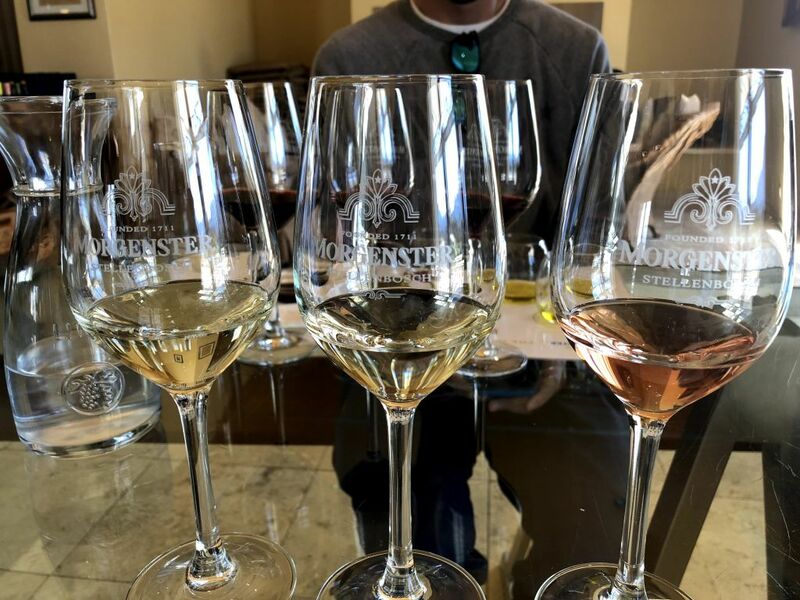 Since he’s spent ample time in the wine region, he came up with the itinerary and which wine farms to visit. From Cape Town, we packed up our stuff and a private car picked us up to take us around the wine country. Our first stop was Morgenster, one of Johnny’s favorite farms. 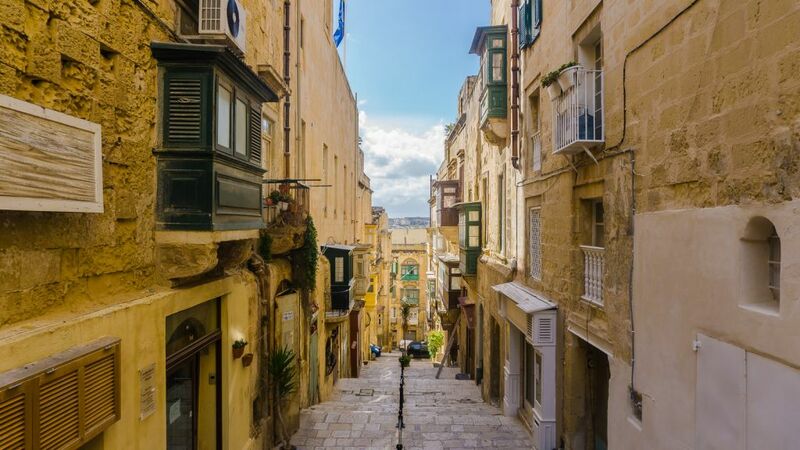 Famous for wine and olive making, this was the perfect place to start. 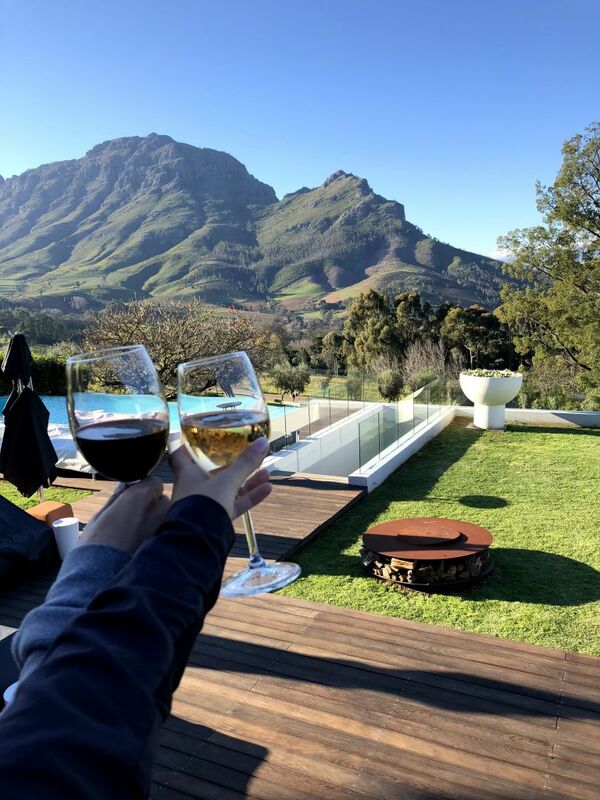 We had the wine and olive oil pairing outside with stunning views of the mountains. The olive oil and olives were fantastic, offering a great complement to the wine. The best part? It’s so incredibly cheap compared to what we’re used to back home. A wine and olive oil tasting was R50 per person ($4 USD). 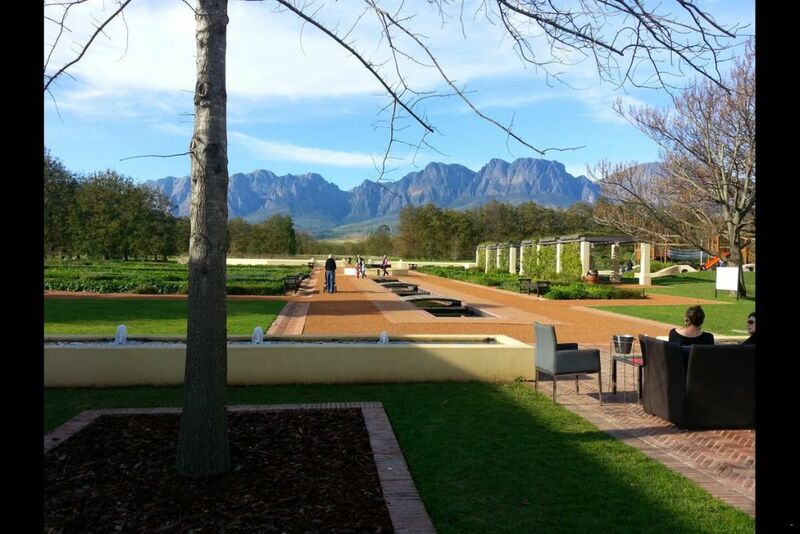 Stunning views from Waterkloof wine farm. 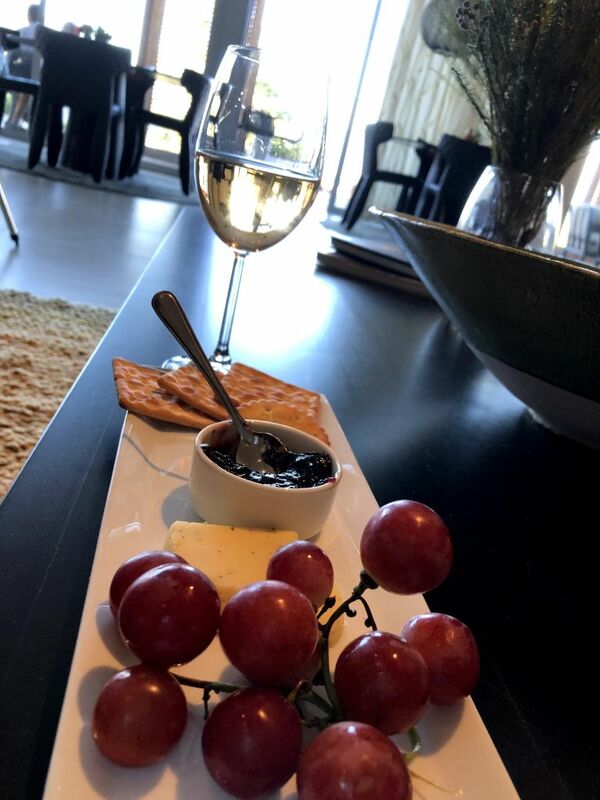 After Morgenster, we had lunch at the Waterkloof Estate at their signature restaurant which featured fresh, homegrown cuisine with a French twist. 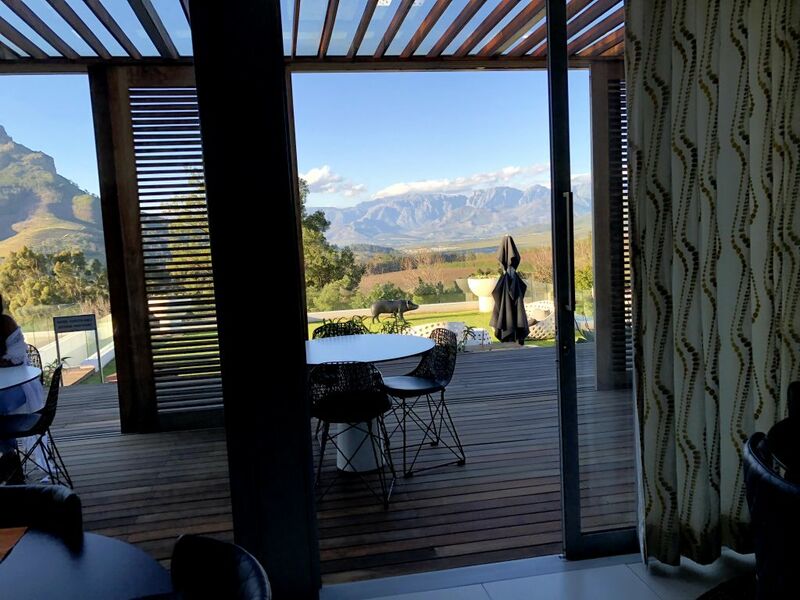 This wine farm had views all around. 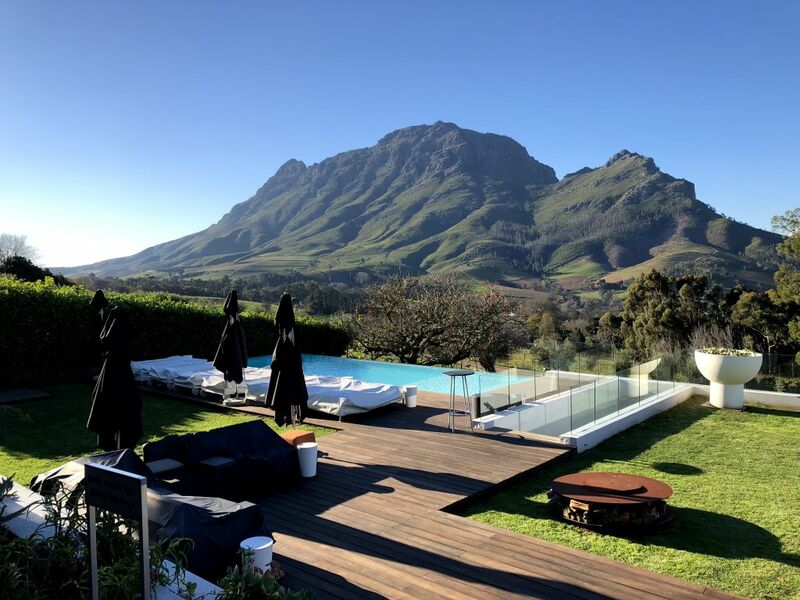 Clouds Estate offers luxurious suites in the valleys of the Drakenstein and Simonsberg mountains along with a pool and small dining room, but it is not far from other wineries. Some suites include a pool beyond the patio. The rooms are equipped with air condition/heating, a kitchen and very spacious bathroom. 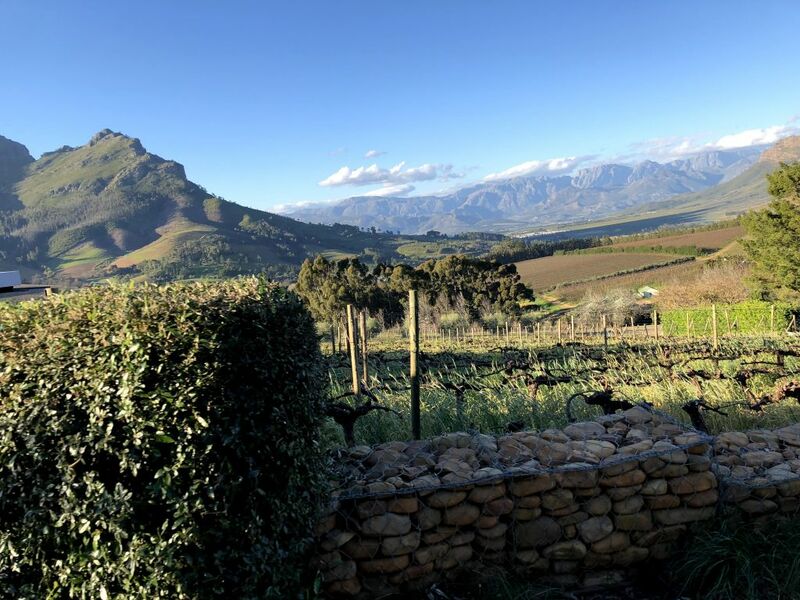 We stayed in the deluxe room and our front porch offered breathtaking views of the surrounding Simonsberg mountain region. The staff were also incredibly accommodating, even leaving us a floral spread to welcome us on our honeymoon stay. 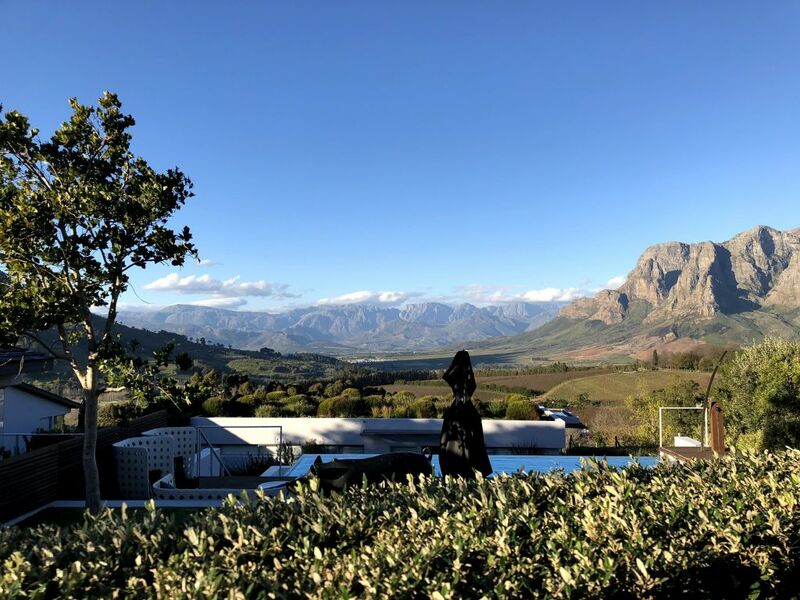 While here we had the opportunity of wine tasting and lunching at Delaire Graff, and Tokara, all very unique places where locals and visitors come for a calm, relaxed meal and drinks. 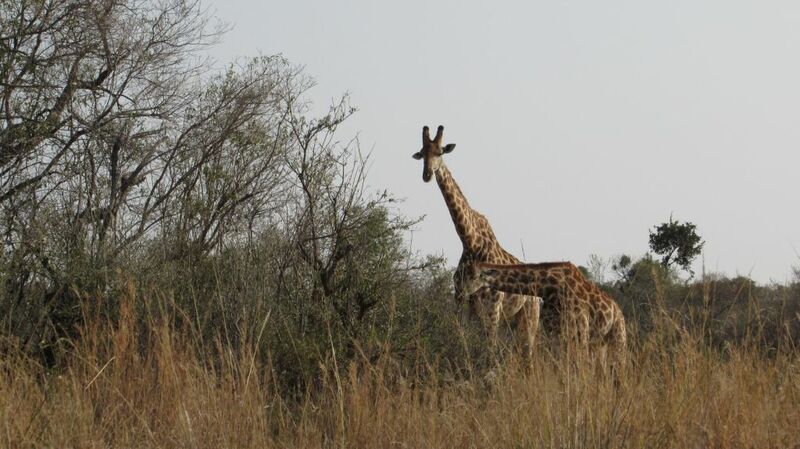 The gem of the trip was our third stop, Mhondoro Game Lodge in Limpopo. If there is one thing you do in South Africa, this is it. From Cape Town, we had an early morning departure to Johannesburg. We flew on FlySAFair, a domestic discount airline for the 2 hour trip to Lanseria Airport near Pretoria. Our game lodge was located in the Limpopo province and this was the nearest airport. 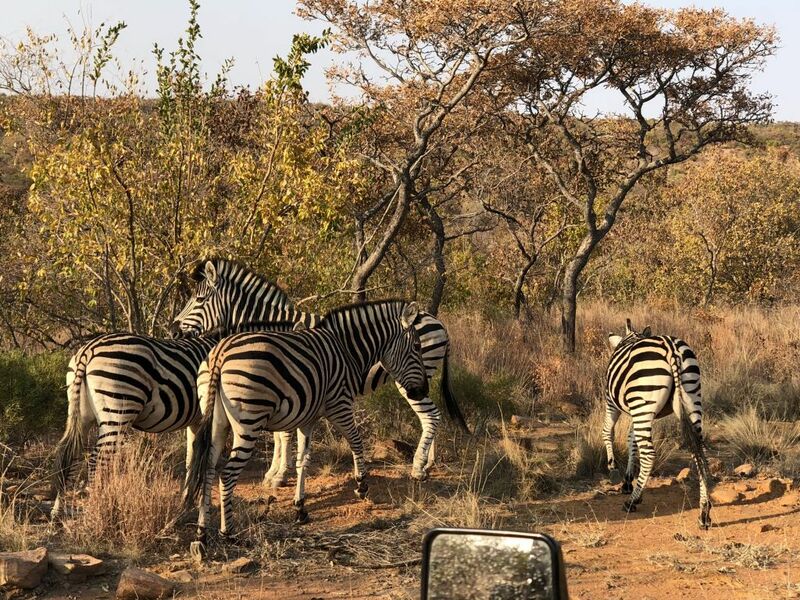 This is not the Kruger National Park (which was one of our original options) but the whole northeast region of the country is home to numerous game reserves, all as stunning as the Kruger. 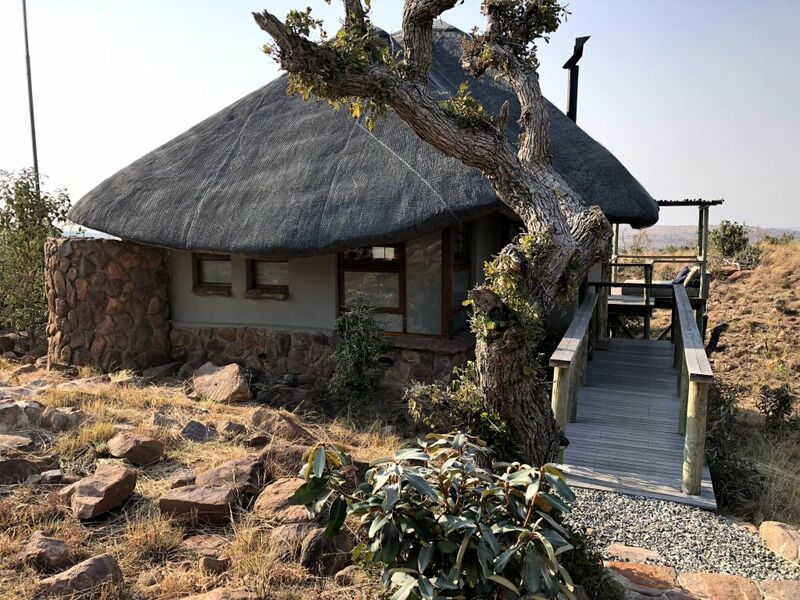 A three-hour trek from Lanseria, Mhondoro is a five-star lodge and villa resort planted in the heart of the country’s best, malaria-free game reserves. 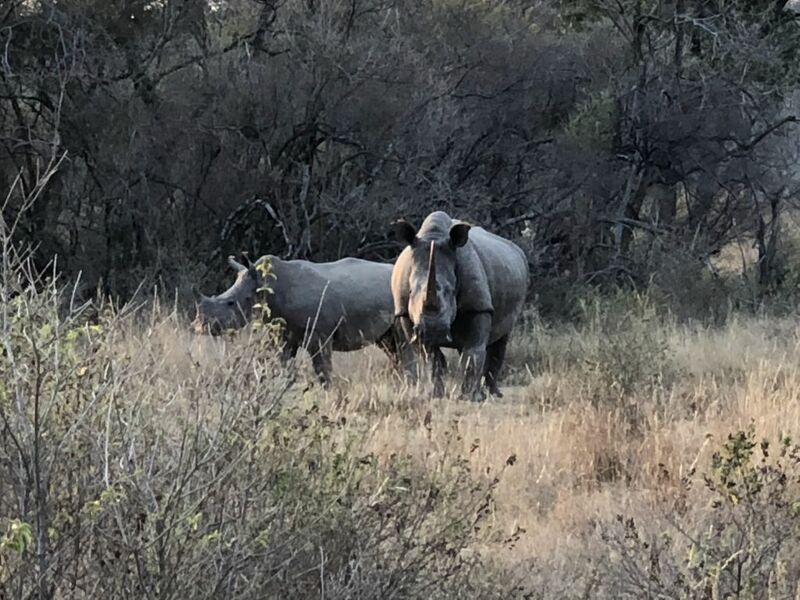 This is your destination to see the Big Five – elephants, cape buffalo, lions, leopards and rhinoceros – among many, many more. Johnny booked our stay with Mhondoro lodge using Booking.com which was slightly cheaper than what was quoted. 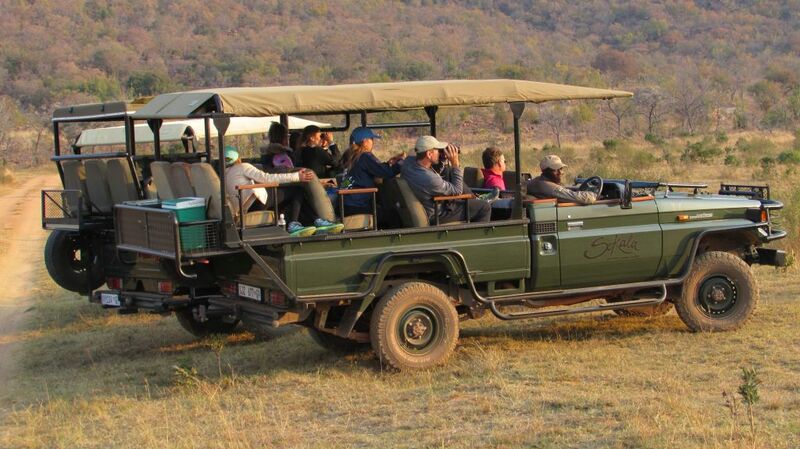 Two game drives a day, one at 6:30am and another at 4:00pm, each lasting three hours. This is the opportunity to explore wild animals in their natural habitat, getting as close as possible without being put in any danger. 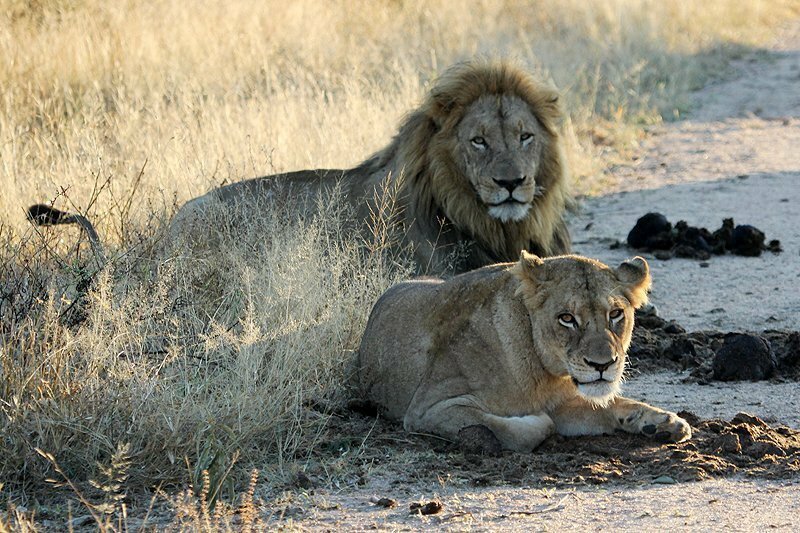 During our first drive we were fortunate enough to come across lions, male, female and their cubs. We saw the lions attempt to attack a mother rhino and its baby before realizing it had little chance against a fully grown rhino. Throughout our 3 day stay, we came across a herd of 30 elephants, giraffes, baboons, different species of deer and buck and plenty of zebra. There was something to see every drive and we never tired of it, even after the third day. The staff at Mhondoro is beyond accommodating, catering to any dietary needs. 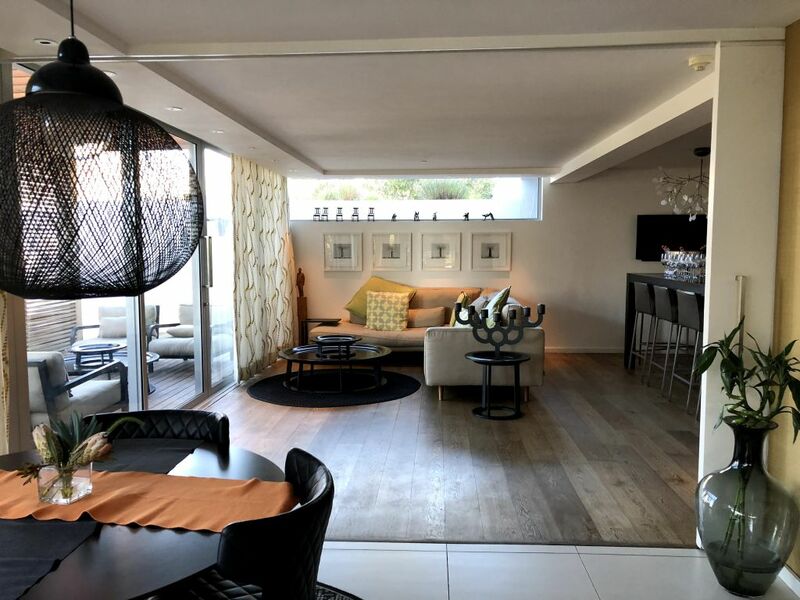 The suites are spectacular and the view can be taken in while standing on the elevated wooden deck situated with a pool. Upon returning from dinner the indoor electric fireplace will already be running and a warm water bottle under the blanket. If you’re lucky enough (we were not), elephants will come poolside to drink and splash around. 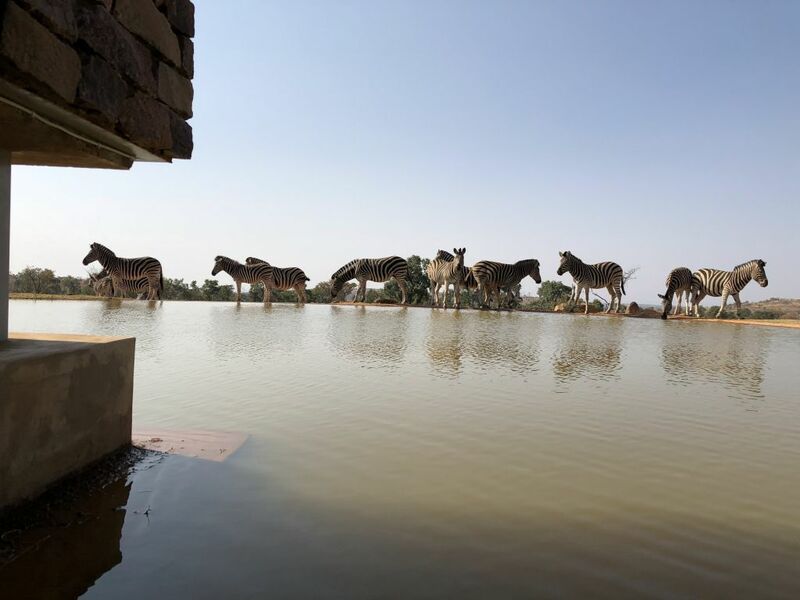 One of the coolest parts of the lodge is the watering hole for animals to drink just across from the main deck. Animals like zebras, elephants, wildebeests, baboons and warthogs will frequent the water at random times, and usually in large groups. Unlike anything I’ve seen before, Mhondoro features an underground tunnel allowing you to get to the cusp of the watering hole for incredible pictures of the animals quenching their thirst. 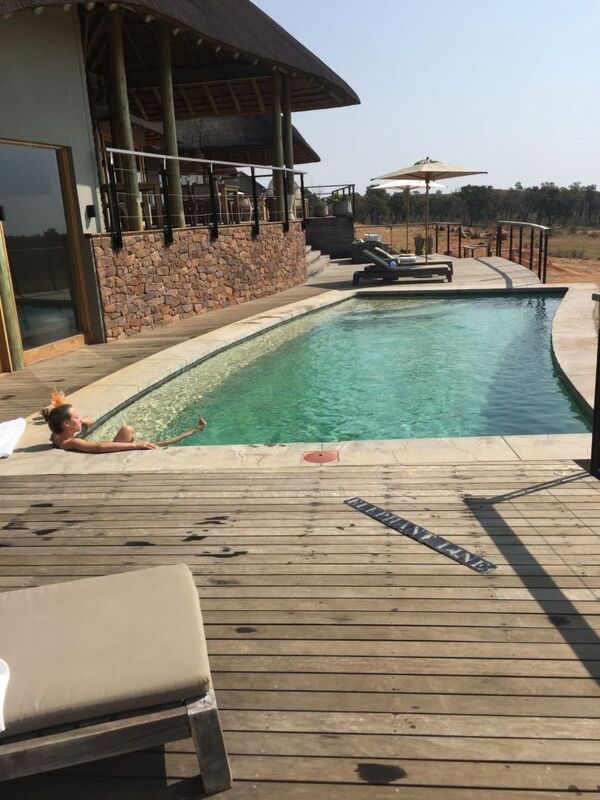 This 3-night stay at Mhondoro was sensational and definitely the highlight of our stay in South Africa. And not to mention, all of your meals and wines at Mhondoro are included. We had group dinners every night sitting around a fireplace and the food was fantastic every time. All in all, we had an amazing time at the Mhondoro lodge and would highly recommend everyone to stay at this lovely lodge! After leaving Mhondoro we had a long ride to Jo’Berg for a flight to Mauritius. On the way we visited Lion Park and Safari for an up-close interaction with some lions and cubs. 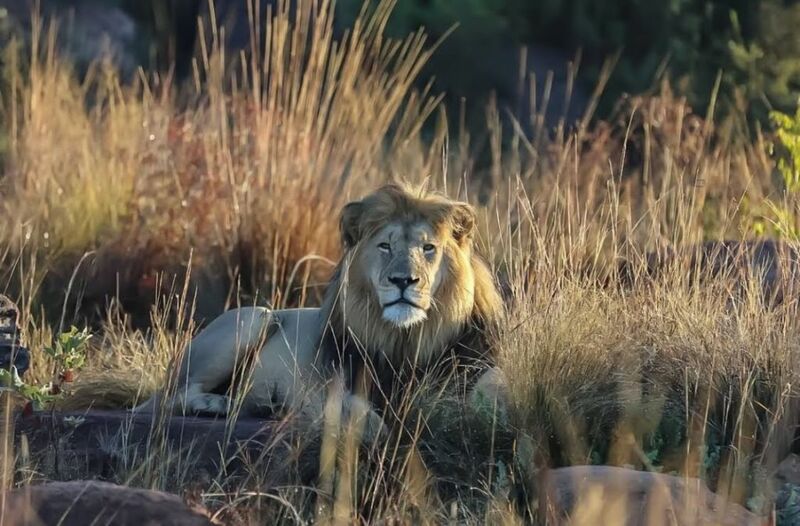 If a real safari ride wasn’t enough, the lion park is a great opportunity to get up-close with one of nature’s most fearsome predators and their lovable, playful cubs. 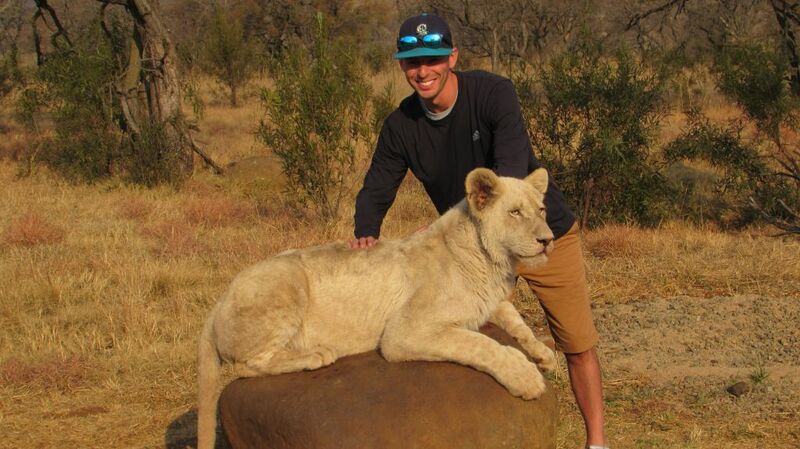 We booked the “lion walk” safari where we were able to walk alongside teenage lions (11 mos. old) and they were already intimidatingly large. We also interacted with grown cheetahs and their cubs which was quite a treat. 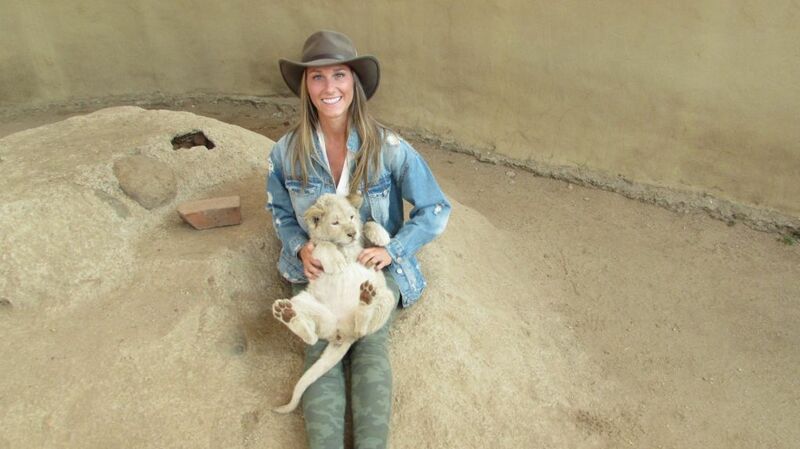 Lion cubs are the most amazing. 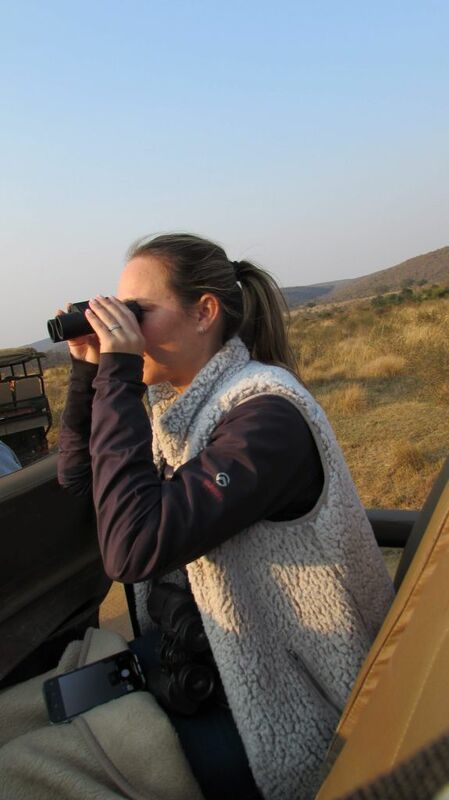 I wouldn’t say the Lion Park is a must visit but it was on the way from Mhondoro Lodge to OR Tambo. 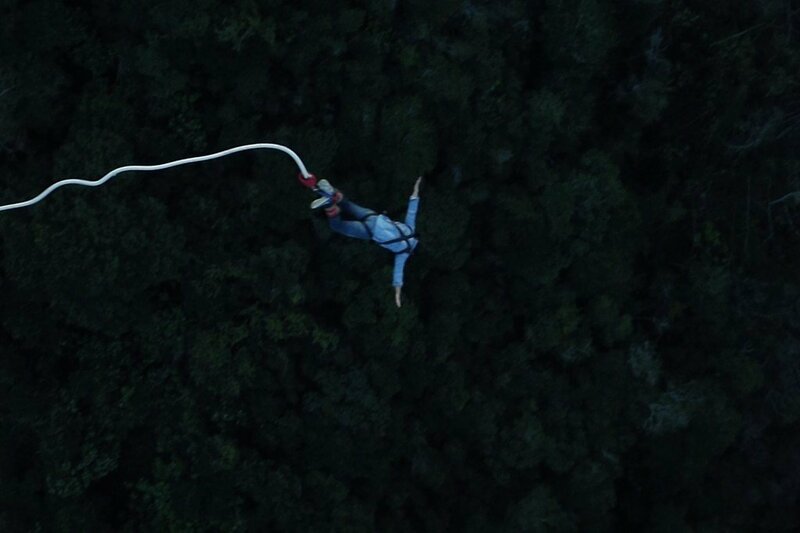 Our flight to Mauritius was the following morning so this gave us something to do during the day instead of just hanging out at an airport hotel all day. Johnny’s planning up to this point was flawless. 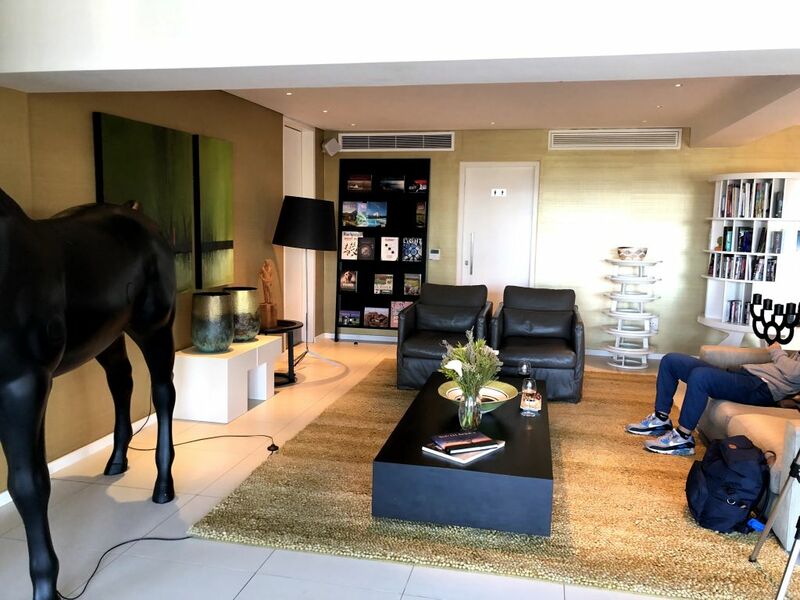 How could he top our stay at Mhondoro? Mauritius is its own country, an island off to the east of Africa past Madagascar and would give Mhondoro a run for its money. We flew Air Mauritius from Johannesburg to Port Louis which took 4 hours. Johnny had pre-arranged us a taxi pickup at the airport which was only 35 euros one way, as opposed to the exhorbitant prices of the St. Regis at more than double the cost. We flew home from here as well on Emirates from Port Louis to Dubai to NYC. Mauritius is more like the Bahamas than South Africa. As honeymooners at the St. Regis, it is no exaggeration when I say they go out of their way to treat you like a king and queen. A luxurious resort right on the ocean, the St. Regis offers everything you need in a vacation. 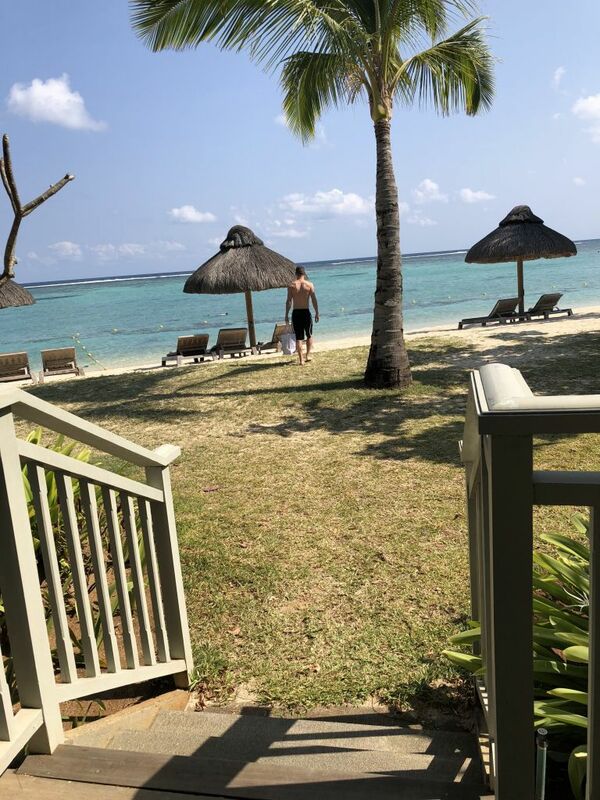 Butler service, a world-class spa, a bevy of restaurants to choose from (not included), water activities in addition to a professional staff and beautiful suite, courtesy of Johnny. Since Johnny is an SPG Gold member from his travel hacking, we got upgraded and had free breakfast the entire time. This was the ideal ending to our honeymoon. The scene at sunset over the Indian Ocean is just steps away from your room. In terms of dining, the breakfast buffet is included. For dinner, options range from the floating market of Pan-Asian cuisine and sushi to The Boathouse Grill and a taste of Indian food at Simply India. 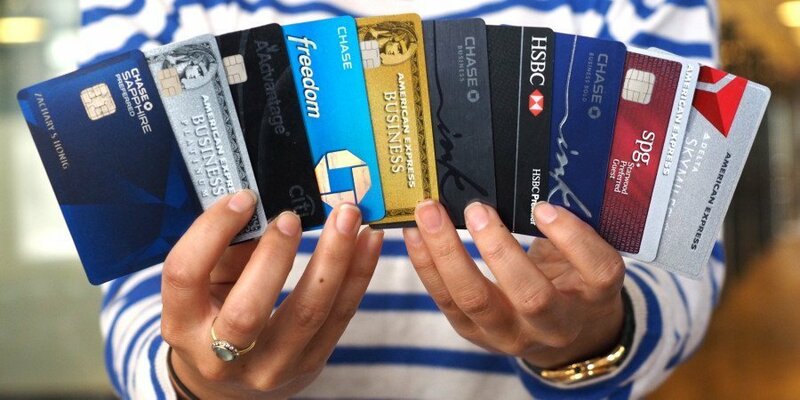 DO you prefer the standard dinner buffet? They have that as well. If you are contemplating a trip to South Africa I have no reason to try to convince you otherwise. There is so much to explore and experience, perhaps too much, but that’s where the expertise of John comes in. 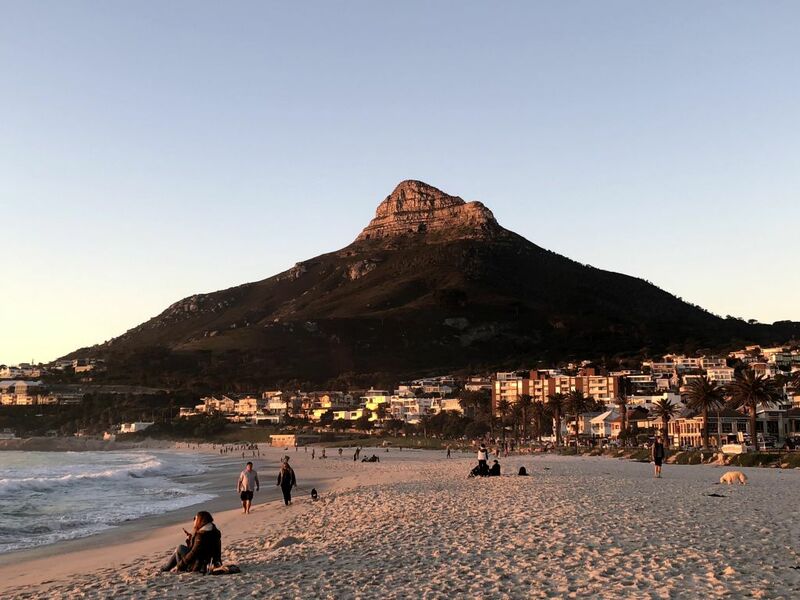 From hiking trails and mountains, riding through the safari to spot the Big Five, hanging at the beach or even historical perspectives, South Africa has it all. Not to mention, you can definitely take the kids and still capture all the brilliance of South Africa. Johnny has written extensively about his travels throughout Africa. Here are some of his posts that I found very helpful before embarking on my trip. If you don’t plan on working with him, make sure to read his other posts as they’ll help you with your planning! 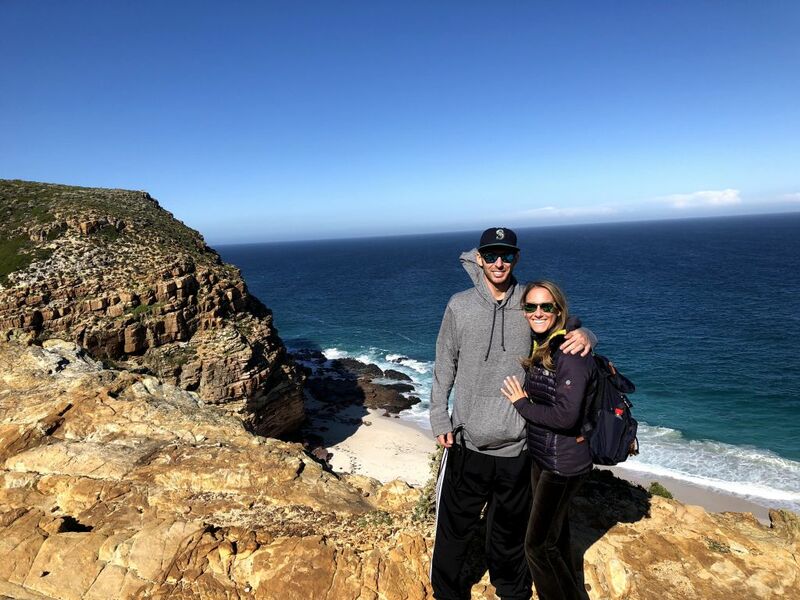 For starters, read his top moments traveling through Africa post where he details his favorite spots and moments through 12 different Sub-Saharan countries. Johnny Do you offer your services in planning a trip similar to the one above? Hi Steven! Yes I certainly do. Just use the Contact page to send me an email to talk about your dates, what you had in mind, etc. and can take it from there!